There are plenty of events that provide visitors and residents with the chance to explore Charleston’s legendary food scene, historical background, and beautiful beaches, but the Cooper River Bridge Run takes the fun and excitement to another level. This family-friendly 10K race combines a great workout with the best view in Charleston and an extensive lineup of food and entertainment! There’s so much family fun packed into this event that you’ll make it into a family tradition. After you take a rest from the run, take a look a look at our free Isle of Palms Vacation Guide so you can get back out and explore our stunning South Carolina Lowcountry gem and everything that it has to offer! Make sure you pick up your race day packet at the specified times listed on the Cooper River Bridge Run website if you did not request them in the mail. You can also pick up your packet at the Bridge Run Expo at North Charleston Coliseum where the Taste of the Bridge run takes place the day before the big event! Bus shuttles pick up and drop off runners from different locations around Charleston in addition to a boat shuttle between downtown and Patriots Point. The Cooper River Bridge Run begins in the lovely suburb of Mount Pleasant, which lies in between IOP and downtown Charleston. The start line for the six-mile race is at the corner of Simmons Street and Coleman Boulevard in Mount Pleasant, where you will follow the main road up onto the Arthur Ravenel Jr. Bridge. Things can get a little packed here, but the slower pace gives you tons of time to gaze out across the mouth of the Cooper River into Charleston Harbor, where you’ll see the USS Yorktown at Patriots Point to your left, and the city of Charleston to your right. Once you run the entirety of the bridge, you’ll finish the last leg of the race on Meeting and King before curling around to the finish line at Marion Square! Take a look at the Cooper River Bridge Run map! You can also check out the Facebook page for more updates and details on the race! Get ready to celebrate in the heart of Charleston after the race! Marion Square holds live entertainment, food and merchandise vendors, and much more! Check out the Cooper River Bridge Run site for more entertainment info as the race date inches closer! East Islands Rentals is the perfect place to enjoy your spring vacation on Isle of Palms! Kick back and relax on your porch overlooking the beach after a fun but exhausting day of Cooper River Bridge Run fun! We have an extensive list of oceanfront vacation homes that give you the opportunity to be just steps from our beautiful span of golden sand! 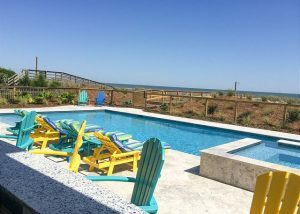 In addition to having excellent locations on IOP, we also provide our you with guests services to help you make dinner reservations, schedule babysitters, and rent beach equipment! Check out our area and a complete list of vacation rentals so you can start planning your spring getaway to the Lowcountry today! We look forward to welcoming you to our Southern paradise!